Were back to the rat race and I do think that the dirty old rats are winning already. The old Plymouth van that we have sounded like a truck so the first thing I did was give it a new muffler. Afterwards I had to resurrect my dead, WV diesel Jetta. (300,000 miles). A used battery and a lot of bleach to take care of the mold inside (there must be a leak in it) and it finally started. It feels strange to have transportation at my disposal when we have gone almost a year without the use of a car. Then, it was out to the marina to look at our ‘potential” new summer home. It’s a bit of a down size from the Snow Goose. It’s a 30 foot Morgan that needs a bit of work. Anna still has to take a look at it so the jury is out on any final decision. We hope to have living arrangements completed in the next few days so as they say on TV,,, stay tuned! The trouble with leaving your “home” and going away for a few months is that you have to do a lot of work on everything and in the case of the Goose you also have to put a coat of varnish on everything that is exposed to the sun. 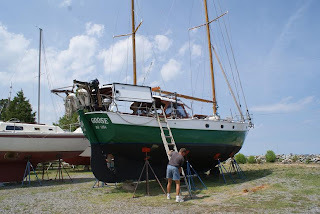 Yesterday it was repair the deck, repair the wood step into the boat, remove and sew and fold up the forward sails (all in 90 deg + heat), and start to sand down all of the areas to be varnished. We have about 3 days of work to do before the goose will be ready to be pulled for the summer. 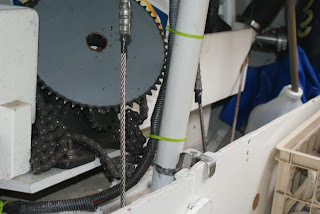 We also have to remember that even here in Deltaville, over 50 miles from the ocean, a hurricane could come through and so we have to strip everything that could create extra windage off from the boat when we store her. So, off come the sails, unnecessary rigging, the spinnaker pole, the booms, and the side solar panels. 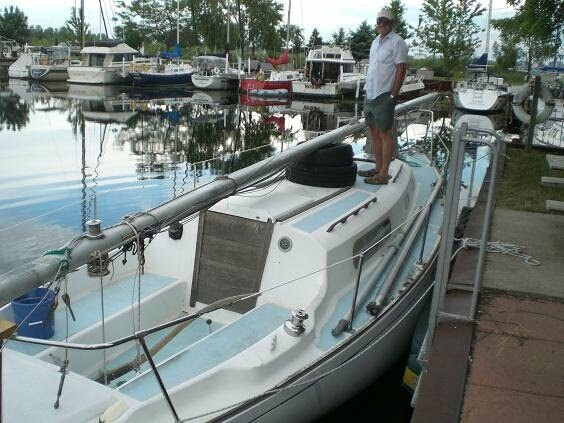 I almost think that it would be easier to go back to the Great Lakes rather than strip the boat down for the season. 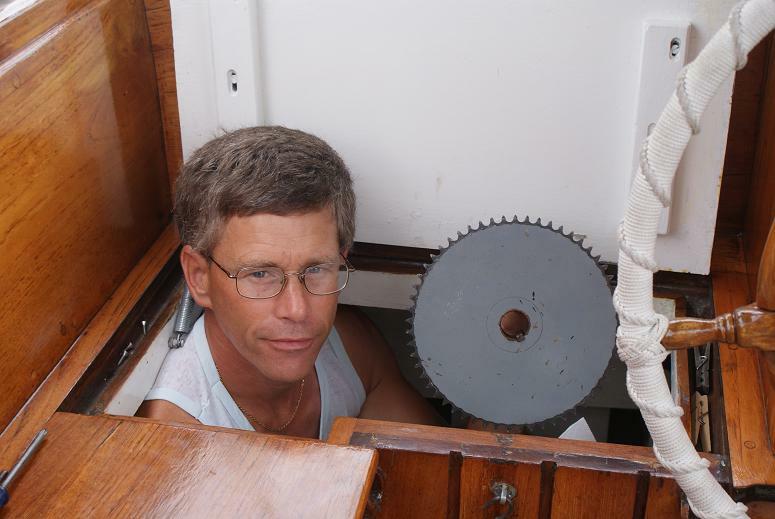 Every good sea story starts with “And there we were…” Well,,, and there we were sailing across the Albemarle Sound when I heard a loud ‘clunk’ in the rear steering area. “Anna, would you come up, we have an emergency” I yelled. The large chain sprocket that our autopilot uses to drive the steering system had fallen off. 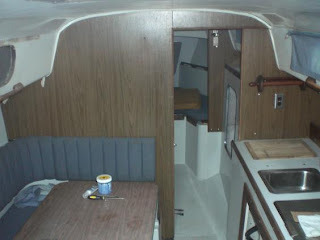 The area is a tight squeeze to start with and with the boat rolling it was no fun to climb down into the seat to replace sprocket. After much sweat, grease all over my hands and a bit of cursing I finally got the sprocket onto the drive shaft and locked back into place. Anna had to hand steer the Goose during this interval. She sure was glad to have the autopilot repaired and back on line when I was done! 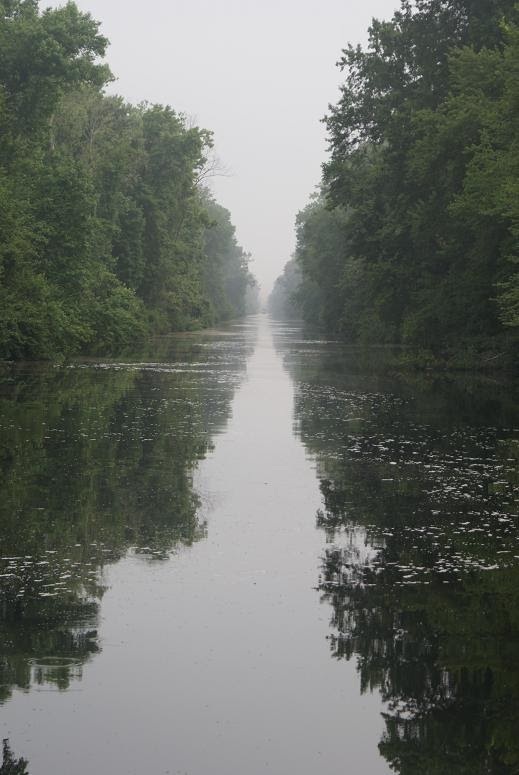 Over 200 years ago they cut a path through the “Dismal Swamp” to make a shorter route to the Albemarle Sound and to access the rich timber stands that the swamp held. It took slaves about 10 years to do the digging and clearing for the project but the result still stands today. 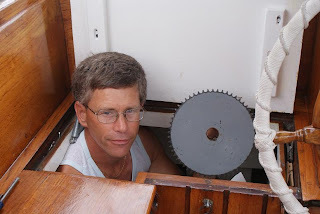 We locked into it yesterday with 4 other boats and started down a part of NC maritime history. 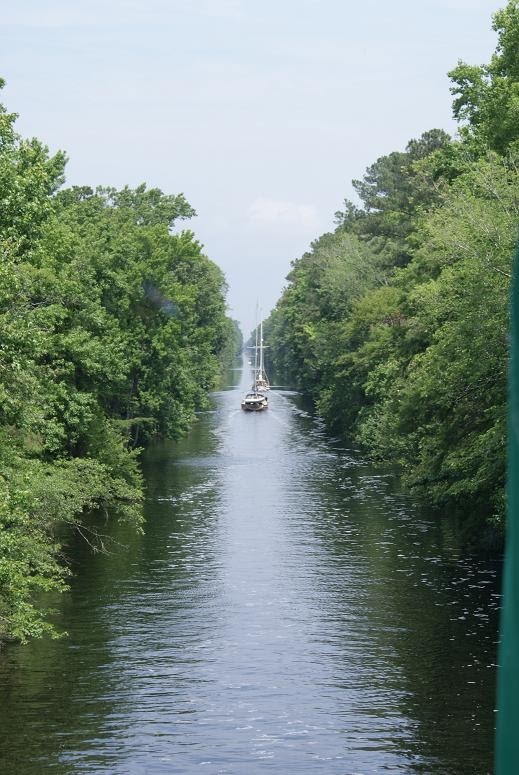 After a while, as we motored between the overhanging trees of the canal, I had Anna take the wheel and I took the camera and climbed the mast to stand on the spreaders and take some pictures. I was about 30+ feet in the air and moving along at 5 miles /hour. It felt like I was flying through the tree tops. Some of the branches were so close that if I had moved out to the tip of the spreader I could have plucked leaves right off from the branches. It was fantastic. Here's the canal in the early morning and an aerial shot "flying" through the trees.